Richard and Pixie Hicks have owned and operated Hicks Taxidermy in Northport, Alabama since 1979. Colby Hamner has been working with us for the past dozen years. We invite you to visit our showroom at 703 Main Ave. Northport Alabama. We are open Monday-Friday 9-4:30. FROM THE TUSCALOOSA NEWS: Like most newly married husbands, Richard Hicks would occasionally bring things to his wife, Pixie, to make her happy. “He would pick up dead animals off the road and bring them to me to practice on,” said Pixie Hicks with a smile. Most folks don’t talk about road kill in the same breath as roses and chocolates but then, they’re not taxidermists. For more than 25 years, Richard and Pixie Hicks have worked together to bring trophy fish, birds and animals back to life for West Alabama hunters and anglers. “Some people ask how we can work and live together 24 hours a day,” Richard shrugged. “Other than the normal disagreements, we don’t have a lot of problems with each other.” Both admit they have other interests when they need to get away from each other. But it also helps that they genuinely enjoy their work together. And their strengths complement each other. Richard is personable and gregarious. “The greatest thing about this job is when you meet people, they’re excited and they want to tell you their story,” Richard said. “It makes the job something you can go to and feel good about every day.” His personality makes him the ideal person to deal with customers, Pixie said. “He makes everybody feel like he could take all day to listen to their stories,” she said. Pixie sees the birds and animals she mounts as more than just trophies. That’s what attracted her to the business. “I thought I could be artistic,” she said. “I’d always been interested in painting or working with clay.” The most interesting part of her job comes when she can work with a mount that involves two animals. She works to convey the emotion they would feel during the encounter. A pair of rival predators bare their teeth and lower their ears, while a pair of small mammals might view each other with curiosity. Pixie recalls a drake and hen eider, a northern sea duck, that she mounted. The hen is sitting on her nest while the drake is positioned standing above her. He looks down at her with a slight tilt of his head that might convey affection. “You can have them interacting with each other and making eye contact,” she said. Richard and Pixie met at the apartment complex where they both lived. Pixie had come to Tuscaloosa with Warehouse Grocery and Richard was teaching school at Holt. An avid fisherman and hunter, Richard began mounting his own bass back in the mid 1970s. After they married, she found some of his old books on taxidermy and began looking at them. It piqued her curiosity. Deer hunting was growing rapidly as a sport in the early 1980s, when hunting methods were in transition. Into the 1970s, most deer were shot running in front of dogs by hunters using shotguns. 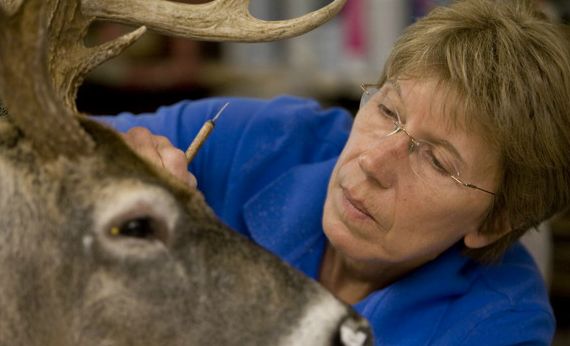 Hunters didn’t have a lot of time to assess the quality of a deer’s horns before they took a shot. But as more hunters began hunting over food plots with high-powered rifles outfitted with scopes, they could take stock of the animal before they fired. Antler quality and trophy management began to take on new importance. And that meant new opportunities for taxidermists. “In the beginning, it was hard to make a living and health insurance was so expensive,” Richard said. Richard hung onto his teaching job with its steady pay and good insurance while Pixie learned the trade. Eventually, they bought a house on Northport’s Main Avenue and worked from their house. People soon came to appreciate Pixie’s talent. “It’s one of those things when it starts growing, it sort of gets out of hand,” Richard said. Richard handles the fish and deer mounts. Pixie handles the birds, small animals and full body mounts. They also have two employees who help with the skinning and fleshing. The busiest time of year is November through January, deer and duck seasons, and the trophies from overseas trips help fill the slow period after deer season ends. The trophies have to come through customs, and it’s up to eight months before the Hickses can get them. They always start by taking an animal’s measurements. Then they order a form based on the measurements and how the customer wants the animal mounted. Next, they carefully and painstakingly skin the animal. Once the skin is removed from the carcass, all of the flesh and fat must be removed from the skin. For fur-bearing animals, they use a fleshing machine, which has a circular blade. They use a “degreaser” a stiff wire brush, on bird skins. “It has to be clean to get a nice clean mount that will remain clean over the years,” Pixie said. They then add a preservative to the skin and stretches it over the form. After it’s mounted, it goes into a drying room. Once it emerges from the drying room, Pixie adds the finishing details that bring out life-like qualities. The birds are the most difficult. “They’re hard to learn and hard to mount,” she said. “They’re delicate and they’ve been shot. You have to do repair work on them.” The couple won’t mount protected birds such as eagles, owls or hawks, and Pixie isn’t eager to mount any more skunks. But just about anything else that comes in the door is fair game. Some requests are downright weird. An art student at the University of Alabama asked Pixie to mount a possum sitting in the lotus position wearing a necklace. It was mounted on an old record player so that it spun in circles. Two men brought a freshly killed rattlesnake whose head had been cut off. They wanted Pixie to skin it immediately so they could take the meat home and eat it, but she decided she couldn’t handle it after the headless snake’s reflexes caused it to keep striking at her. Over the years, some things have remained the same. Bass and deer are the number one mounts. But the sort of people who put their trophies on the wall have changed. “It seems to me that it’s more acceptable for a city dweller to have a deer head in the house,” Richard said. “That used to be a farmhouse thing.” They’ve even worked with interior decorators who are working with taxidermy strictly as a design element. But for the most part, their customers are hunters who want a trophy to help them relive their hunting trips.